I try not to drink my calories unless there is alcohol involved. That being said, my fridge usually only has two beverages in it: water and soy milk. However, there is also usually one or two bottles of gatorade in there that I save for emergency situations (food poisoning, hangovers, etc). The nice folks over at Code Blue shot me an email with some information on their new'ish (launched last year in Boston & NYC) all natural recovery drink. They also sent me a few cans to try out. 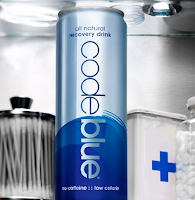 Code Blue, the world’s first complete recovery drink, launched late September  in New York, Boston and online. Designed by beverage scientists, Code Blue is ideal for anyone who’s ever had a late night out, tough workout or long flight. 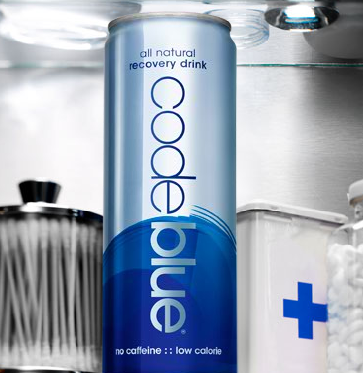 Code Blue’s all-natural formula hydrates, replenishes, detoxifies and reduces inflammation. The non-carbonated, caffeine-free drink is sold in a 12-oz. sleek can at select retail establishments, nightclubs, restaurants, hotels, gyms and spas. Today, I decided to try out the 'tough workout' portion of the description. I ran 3.5 miles and then did some lifting and had a code blue when I got back to my apartment. Not bad, definitely quenched my thirst. I guess I'll see tomorrow if I'm any less sore than usual. It comes in a can reminiscent of a Red Bull can, but a lil bigger. I immediately looked at the nutritional information. 40 calories per serving (60 in the can) - also not bad. 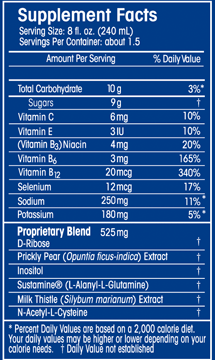 There's also a ton of vitamins, electrolytes and a proprietary blend containing: D-Ribose, prickly pear, inositol, milk thistle, sustamine, and NAC. I looked up a few of these proprietary blend ingredients like the milk thistle and the NAC and those are supposed to help with the detox and reduction in inflammation aspects. I'm looking forward (sort of) to testing out the part about helping me recover from a late night out. That's how much I like you guys, I'm going to give myself a hangover for the sake of science and testing out Code Blue. Of if any of you have tried it already, leave a comment. You'll save me the headache, literally. Click (here) to visit Code Blue's website. 4 Response to "Code Blue Available In Boston"
Hard to describe. If i had to put it into words, it has a little bit of citrus flavor and maybe a 'tropical fruit' type flavor. Like I mentioned in my post, I don't drink a lot of sugar these days, so I actually found it to be fairly sweet although most other reviews I read about it tend to say that it's only lightly sweetened. It uses a mix of agave, sugar, and stevia. I am an avid fan of your blog, and was happy to see that Code Blue was on here. I first heard about Code Blue from my friends who swear by it, and always vowed to buy a can from Hemenway Variety. I live in Boston, and met the team last week outside of the Financial District, grabbed a sample and saved it for my weekend 10 miler. It definitely worked!